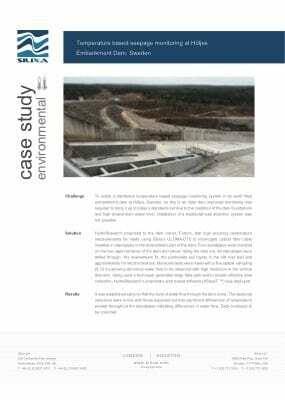 Seepage & Leak Detection - Dam Monitoring with Distributed Sensing | Silixa Ltd. Distributed seepage detection uses the natural seasonal temperature variations that occur in all surface water, such as lakes, reservoirs and rivers. The seepage flow causes a seasonal temperature variation inside the dam. With Silixa’s range of distributed fibre optic sensing technologies and fibre optic cables this seasonal temperature variation can be measured with good spatial resolution along an embankment or tailings dam. 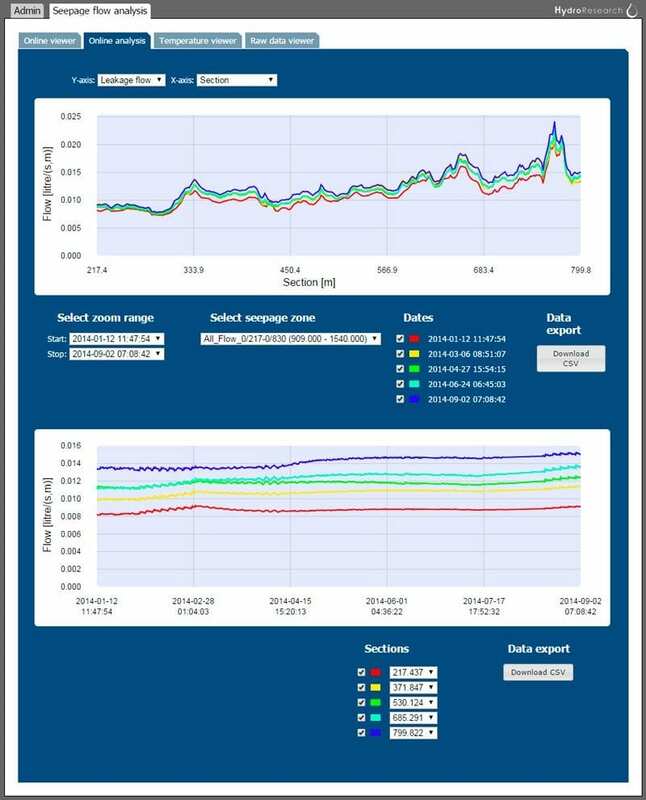 The measured data can then, via XSeepT™ (a real-time data evaluation system), be used for automatic evaluation of the seepage flow through the dam. Temperature measurements can also detect seepage flow changes, such as internal erosion. Generally, a constant temperature indicates a minimal seepage of fluid, whilst large seasonal variations may indicate significant seepage. At increasing seepage flows the temperature in the dam will change, and the seasonal variation will increase as shown in the figure. This temperature variation is therefore dependent on seepage flow, the seasonal variation at the inflow boundary, and the distance from the boundary to the measuring point. Watch our video above to learn how XSeepT reduces the risk of dam failure. XSeepT is an interface processing unit for real time evaluation of seepage using measured temperature data. The system has been developed by Hydroresearch, and customised to work with ULTIMA™ DTS. By instantly transferring and processing raw data, XSeepT presents a visual overview of both the temperature and evaluated data. Seepage data can be calculated and evaluated for each section of the dam. XSeepT can export selected evaluated data to SCADA or ADAS and when sudden temperature changes are noticed alarm signal can be sent via *24V, E-mail or SMS. The seepage flow analysis shows leakage across a dam section analysed in space and time. Challenge: To install a distributed temperature based seepage monitoring system in an earth filled embankment dam at Höljes, Sweden. As this is an older dam improved monitoring was required to bring it up to today’s standards but due to the condition of the dam foundations and high downstream water level, installation of a traditional leak detection system was not possible.